100% polyester. Low rise to hit 2" below natural waist. Elastic waistband with shaped belt loops.Two snap closure with brass zipper. Two single welt rear pockets. Double knees extend to bottom opening. Elastic hemmed leg opening. Inseam length designed to hit under the knee. 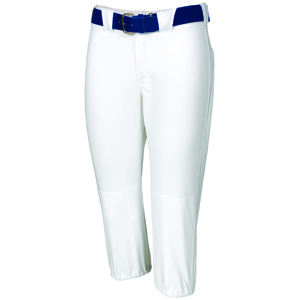 INSEAM: XS-17", S-18", M-19", L-20", XL-21", XXL-22" "R RUSSELL" logo back left hip.